This app note by Microchip describes how to implement ultrasonic ranging on their PIC16 family of microcontrollers. This application note describes a method of interfacing PIC16CXXX microcontrollers to the Polaroid 6500 Ranging Module. Their design uses the Polaroid 6500 ranging module interfaced with the PIC by using a pair of digital output pins and one CCP input pin. 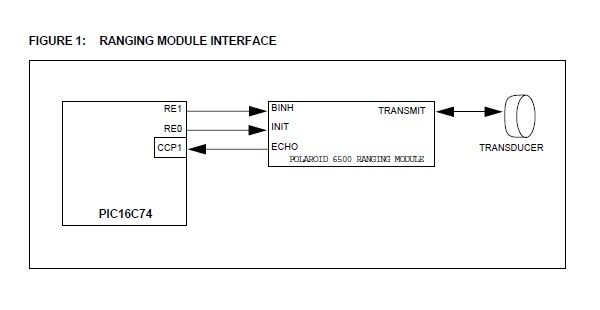 One digital pin (INIT) starts the module, while the other (BINH) provides a blanking interval during which the module does not respond to revived signals. The CCP module is setup to time the interval from initializing the module to the time an echo is received. Assembler source code is provided by Microchip. This entry was posted on Saturday, October 29th, 2011 at 10:00 am	and is filed under app notes. You can follow any responses to this entry through the RSS 2.0 feed. You can skip to the end and leave a response. Pinging is currently not allowed.